A short-term bill was passed to end the government shutdown. This reopened the government and provides funding only through February 8. Source: Q13 Fox. On January 19, 2018, the federal government shut down after Congress was not able to agree on a budget. While this doesn’t stop the U.S. 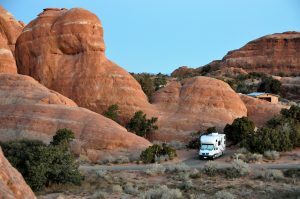 Postal Service and law enforcement, it does affect RVers, hikers, and campers looking to visit the national parks, monuments, and forests. You may run into signs like these at national parks. Photo via Alt National Park Service, Facebook. Park superintendents can close areas if they believe it will protect public safety or natural resources, so you may come across some areas and entrances with locked gates. NPS communications are also down, including their social media and websites. Several national monuments like the Statue of Liberty, Liberty Bell, and Ellis Island are closed because of the shutdown. Many other historical and cultural sites like presidential homes are also locked up. If you do visit, make sure to have a back-up plan just in case your entrance or park is closed. You will want to continue displaying your America The Beautiful pass, if you have one. Keep in mind the roads that run through the parks will remain open, but they will not be maintained, which includes snow plowing. You can also check state transportation websites for information on mountain passes. 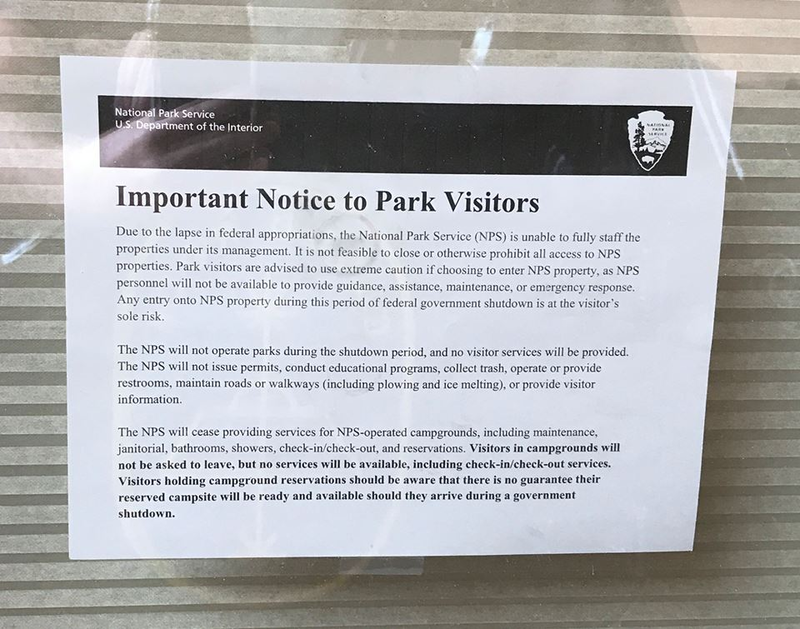 The National Park Service will not be operating their campgrounds. They won’t be providing services and facilities will be locked. This includes the restrooms, showers, check-in/check-out, reservations, and trash collection. Visitors won’t have to leave, but will be notified there won’t be any services. If you already have a reservation for a future date, there is no guarantee it will be ready or available. National forest trails are not closed, but all of the gates will be locked which may limit access to some trailheads. Facilities like restrooms will not be available, the garbage won’t be serviced, and water systems will be shut down. The National Forest campgrounds are closed. The U.S. Forest Service websites and social media will not be updated. This means trail and road conditions will not be posted while the federal government is shutdown. However, you can still find weather conditions on weather.gov. State land will be open like always. This includes state, city, and county parks. For trip ideas, check out these state parks in Arkansas, Georgia, Oregon, Ohio, Texas, Washington, and on the Florida Panhandle. Until a deal can be made, the federal government will remain shutdown. The last shutdown in 2013 lasted from October 1-17th. Post is from 2018. Why show it now? Because relevant now as well? We were campground hosts. We were first told we could stay but we were not allowed to work. Then two weeks after the gates were closed, we were told we had 48 hours to get out. One of the host had been there for three year. We won’t be going back.